If you were living in Birmingham, Alabama between the years of 1923 and 1984, and you needed a birthday cake, you skipped down the street to the Waite’s Bakery. On the corner of Richard Arrington Jr. Blvd and 7th Avenue South, it was the place you went for an almond macaroon, an ice cream or even a hot lunch. For 61 years, Waites was a Birmingham institution until Robert Waite retired in 1984. The building has been bought and sold throughout the years since, though today The Waites Building houses modern luxury apartments, many of which are occupied by students of the nearby University of Alabama at Birmingham, as well as medical personnel from any of the three hospitals located within a mile of the building. Housed on the first floor of the residential building are also a number of trendy and fun restaurants – ranging from the always delicious Blaze Pizza to the super Happy Hour eccentric Taco Mamas. And in the heart of the all the hustle and bustle of the block is a placed called Farm Burger. My first piece of advice if you plan to eat during the week, is get there earlier. The whole restaurant fills up very quickly between hospital workers and students in between classes. Now normally I would visit a place at least twice before posting a review online, just to be sure whether the good and the bad were a fluke or a taste of the restaurant in the real world. 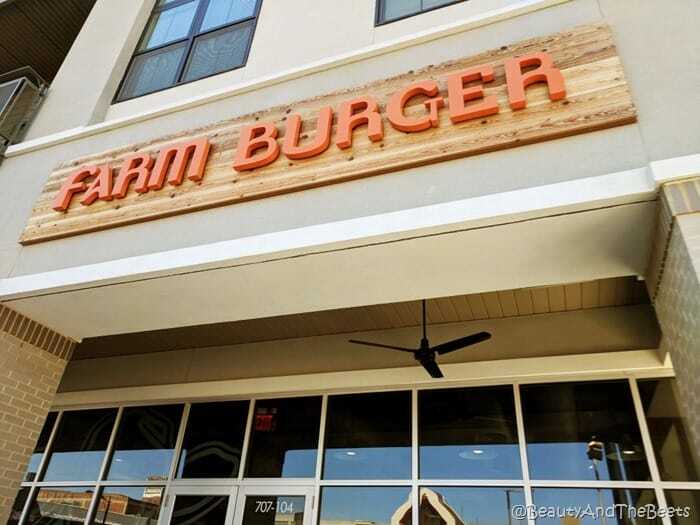 However, I felt with Farm Burger, not only did I have a good experience, it was obvious by the number of locals in scrubs that this was a real popular spot. Mr. Beet ordered his Vegan Burger. One thing we are both very picky about is whether the veggie burger is made in house, or defrosted in the back of a truck from Wisconsin. Farm Burger makes their own super thick patties with black-eyed peas, smoked tempeh and butternut squash. I am also quite particular about the dryness of a veggie patty, often they are so dry they crumble before you can even get a hand around them. However, this burger stayed intact. Served with a basil tofu spread, burgundy onions and sunflower sprouts, this burger was delicious as it was healthy. 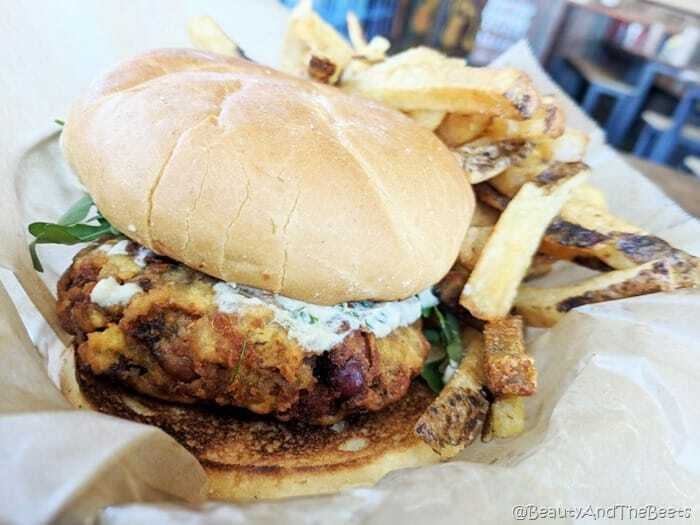 certainly one of Mr. Beet’s top favorite among the veggie burgers we have tried. 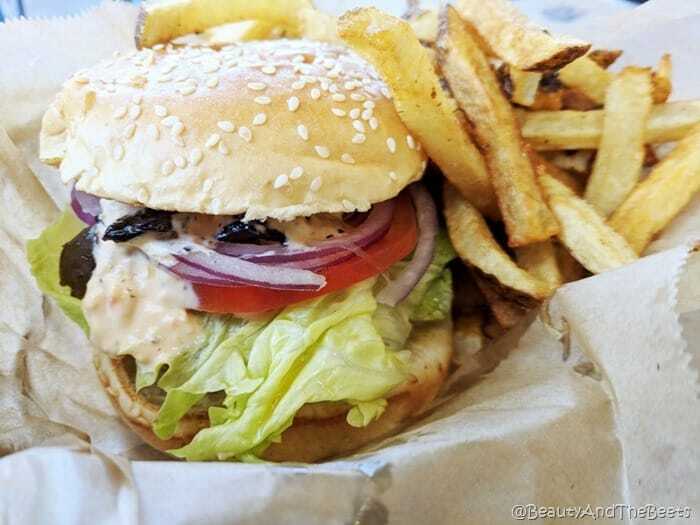 I went for Build It Burger- choosing a grass-fed beef patty topped with lettuce, tomato, onions, sautéed mushrooms and Farm Burger sauce (a mix of mayo and ketchup – pretty standard across the board with boutique burger bars). While the burger was very good, there wasn’t anything in particular that made Farm Burger stand out more than the last gourmet burger I visited, except………..some of the toppings choices were quite unique. Free toppings include smoked paprika mayo and pickled jalapenos; for an extra $1 you could add a farm fried egg or feta cheese; an extra $2 gets you oxtail marmalade or pork belly; but for an additional $3, you can enjoy your burger with roasted bone marrow. I admit, the bone marrow struck me as something I needed to try, but alas, they were out of it the day I visited. Good thing though, it may have really disgusted my veggie loving Mr. Beet. The other extra special touch for me was the Maine Root soda fountain. 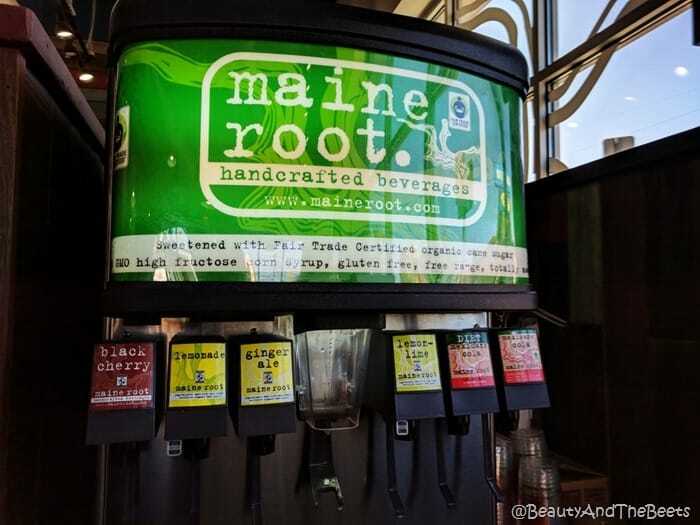 Nowadays, soda is either Coca Cola or Pepsi, but to see a restaurant with an actual Maine Root fountain was so amazing to me. Suddenly, the burgers went up a few notches on the gourmet scale and the place became upscale without the upscale prices. 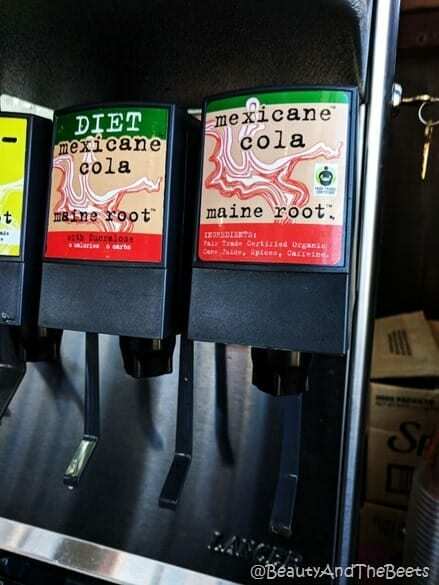 Mexicane Cola from Maine Root is probably up there on my list of favorite beverages, maybe taking a spot only behind real Southern sweet tea. Again, just a reminder, if you are planning to eat during the weekday, arrive early before the lunch crowd, or wait until everyone goes back to work. This place was hopping. 4 1/2 out of 5 sprouts.